Todd: The fifth season of Mad Men was a curious one for me, because though I found it great, I was constantly aware that it was telling me how great it was. I usually don’t like that sort of ostentatiousness in my television. I’m much more into shows that quietly assume we know they’re great, and get the job done. Yet there was Mad Men showing off at every turn, putting on a razzle-dazzle show (well, as razzle-dazzle as Mad Men ever gets) and insisting on its own profundity. And except for a few scenes in a handful of episodes, I loved every second of it. If I were to look at all the seasons of TV I’ve graded since starting work at The A.V. Club, I would wager that the fifth season of Mad Men is the one I’ve given the most As per capita. I was just blown away by so much of this season, to the point where I was slightly downgrading episodes that would have been all-time classics on any other series, just because they didn’t quite live up to the episodes around them. Yet as I step out of my TV Club cocoon and look at how other people experienced the season, I see it’s highly divisive. And if I’m being honest with myself, the final three episodes—including “The Other Woman,” which I loved—soured me just a bit on the season as a whole, in ways I’m not really sure about just yet. (In a couple of months, I suspect I won’t care, but we’re not writing this in a couple of months.) Opinions seem roughly divided between those who think this was the show’s best season yet and loved the new, showman-like attitude, and those who think the series has started underlining its own thematic ideas too forcefully—something that tripped me up about those final three episodes. But I write nearly 3,000 words about this show every week, Keith, and I have yet to hear what you think about the season, outside of a few stray words on Twitter. So I’m going to keep my introductory thoughts brief and toss you a few questions: Which side do you fall on in the debate over this season? Or do you fall somewhere in the vast middle with me? Finally, what did you think of Megan, who’s by far the most controversial point of debate on sites other than our own, where I’d say people like the character more than not? Keith: I’m firmly on the “pro” side of this season, which is as confident and accomplished as any season the show has produced. Mad Men has been so rich—episode-to-episode and as a whole—that for me, not writing about it this year has been kind of painful. You did a great job of it, Todd, but watching it without unpacking it in essay form felt like an incomplete experience. I realize we’re more on the same side than not, but let me start by taking issue with your central premise and going from there. When you say it’s ostentatious and insistent on its own greatness, I’m not entirely sure what you mean. What I saw was a show that carefully presented each episode as a short story—as I believe you pointed out—but had a plan for how each of those stories would fit together and develop each character as they went along. Witness the second half of “A Little Kiss,” in which Lane found a wallet and embarked on a flirtation with a woman he knew only from her photo. In the end, he couldn’t have her, but he kept the photo for himself. That photo resurfaced in the season finale, clutched by Lane’s puzzled wife. It offered concrete proof that she didn’t really know the man she thought she understood inside and out, and it provided another symbol of Lane’s inability to live the life he wanted to live in the country he adopted as his own, but whose ways he never fully understood. If being that good is an instance of razzle-dazzle, then bring on the razzle-dazzle, man. As for Megan, I think she had a lot to do with making the season work. Don’s story this year was largely that of a man trying to be good at being married, and succeeding more often than failing—in spite of some huge, Howard Johnson-adjacent failures—until realizing it wasn’t a marriage he wanted to be in anymore. (At least that’s how I read the finale’s last scene, but I’m sure we’ll get into that later.) Time after time, Don and Megan hit a crisis and worked it out. We saw Don compromise in his personal life in the interest of his partner’s happiness, which never seemed possible before. Finally, he helped her career, which he’d not so secretly hoped wouldn’t succeed. In spite of his protestation, he knows his push will make a big difference. Watching that tense dynamic play out each week helped make this season so compelling. Megan seems, in many ways, completely ill-suited to Don. And maybe ultimately they don’t work together. But watching them trying to make it work gave the show a charge. The difference in their age underscored how Don was getting older and less in touch with the world. (I doubt he ever listened to the rest of Revolver, much less finished “Tomorrow Never Knows.”) Seeing him beside her made him look older than his years, and the way the contrast corresponded with an apparent dulling of Don’s creative abilities gave the relationship worrisome undercurrents. Given how comically handsome Jon Hamm is, his ability to play those aging, out-of-touch notes just underscores what a great actor he is. But the way he carried himself in those early episodes, before the big Jaguar speech and the flesh-tearing pitch to Dow Chemical, gave him the look of a man who’s gotten a little lazy and content to let himself go a bit. And for all Megan’s usefulness in pointing to change in Don, she’s a fascinating character in her own right. Throughout the season, other characters who have looked up to (or just envied) Don became more Don-like, or tried to. By the season’s end, Peggy was playing the part of Don at another firm. Pete was playing the part of Don by carving out a double life for himself. And Lane tried to reach Don-like heights of ambition until his wings melted in the attempt. But Megan moved away from her inner Don. She demonstrated Don-like abilities in crafting an advertising pitch—drawing inspiration from her own life, just like her husband used to do—to create a great idea for Heinz. She could have been great at advertising, but she chose to follow another path. Much of the alienation that crept into their marriage in the season’s second half came from Don feeling personally rejected by her rejection of advertising as a career. Jessica Paré more than held her own in the role. I can’t imagine how intimidating it would be to assume such a prominent role as part of a cast that was already so well-established, but her work continually impressed me. (And, in many ways, her real-life situation paralleled her character’s.) I’ve got no Megan complaints, although if the show heads where it seems to be heading, I wonder if there’s a part for her in future seasons. We should talk about the future, but let’s not get there yet. One of my favorite storylines played out almost without comment: Lane’s infatuation with Joan. In fact, it blinded me to one of the most devastating moments in “The Other Woman”: the fact that he didn’t suggest she ask for a partnership out of kindness, so much as a need to free up that cash for himself. It encapsulates how far that character had fallen. And really how far everyone fell in pursuit of success. (Even Don’s removing himself from the decision-making process of whether to pimp Joan out in the interest of landing Jaguar doesn’t entirely let him off the hook.) Our colleague Erik Adams had a great piece recently about how this season turned Sterling Cooper Draper Pryce into a monster, and that’s one of the season’s strongest themes: The pursuit of success killed Lane, dulled Don, turned Joan into someone she doesn’t want to be, drove Peggy away, and validated Pete’s worst impulses. I’ve often thought of Don’s story as that of a man who gets everything he wants and realizes it isn’t enough. Parts of this season were that story writ large. Todd: When I suggest the show is ostentatious and insistent on its own greatness, I don’t necessarily mean it all as complaint, particularly for a series in its fifth season. Shows this old often spend time lazily setting up stuff viewers would roll their eyes at as pretentious in younger shows, simply because they can. To borrow from two other series that made great use of the Mad Men “series of short stories that add up to something larger” structure, The Sopranos offered up its longest, most indulgent dream sequence in season five, and Lost devoted much of its fifth season to an elaborate time-travel narrative that ultimately had nothing to do with anything, but still made for my favorite season of the show. Mad Men played around with all sorts of structural techniques, became the first TV show I’m aware of to pay for an actual Beatles recording, and got even less subtle in its symbolism, which was already pretty darn obvious to begin with. A friend of mine called it “showboating,” and it was, to a degree, but it was so entertaining and so much fun that I lapped up every second of it. This was a series at the height of its powers just seeing what it was capable of, like a car owner discovering another gear on his old sports car, then giddily showing it off to all his friends. Yet that short-story structure is so ultimately dependent on coming up with a conclusion that ties everything together or spins things off in a new direction, and I’m not sure Mad Men managed that trick in its final series of episodes, much as I enjoyed all of them. I found Lane’s death particularly problematic in this regard. Every step down the road toward his destruction was perfectly played and expertly written all season long, yet so obviously plotted by the writers to lead to that moment where his corpse hung from the back of his office door that I couldn’t appreciate it as the season’s emotionally devastating climax. Instead, I kept seeing how it was supposed to be working while not getting wholly invested in it. (I know many critics had a similar problem with Joan’s predicament in “The Other Woman,” but I bought that one hook, line, and sinker. I’d be curious to hear your thoughts on it.) The writers were so obviously pushing Lane in the direction they wanted him to go that I pushed back. In terms of cornering their characters and forcing them to find new ways out (or reject those ways out), the Mad Men writers aren’t at the level of their AMC colleagues over at Breaking Bad. In many ways, the season reminded me of the old TV writer term “up and back.” An up-and-back is a story that starts out in one place, takes us on a journey to some other place, then returns to exactly where it began, with the emotional arcs and the overall story not advancing. This isn’t really true of Mad Men, since when the characters all land in roughly the same place they began in at the end of the season, they have a much better sense of who they are and why they continue to mire themselves ever deeper in unhappiness. The journey advanced the characters’ emotional arcs—and our understanding of those emotional arcs—but mostly in a way that suggested why they mired ever more in stagnation. It was the equivalent of leaving from one house, taking a long, eventful trip, then returning to a house one block over. Not really an up-and-back, but so close, I’m amazed it worked as well as it did. It worked amazingly well in the moment, but it’s the sort of thing that could fall apart on repeat viewings, or under the strain of having to support the two seasons that will follow afterward. Since the Crosstalk format is making me sound like I liked the season less than I did, let me just say I agree with you on Megan. I’ve read some critics saying the character makes no sense, or that the plot requires her to do things just because it needs her to do them, and I find those ideas bizarre. To me, Megan was incredibly central to the season’s idea of how only certain people have the luxury of certain things—whether that’s doing the right thing, wanting something more, or having an impractical dream. Megan is very good at advertising, and she could be great at it, yet that isn’t what she wants from her life, as confusing as that is to Don. Is she good enough to make it in acting? Only time will tell, but I almost liked the hints we got that she wasn’t good enough more than the ones we got that she was. It was in keeping with the season’s other theme, that idea that the thing we want is a swirling void inside of us that can never be filled. Or perhaps it can, but only after a long, arduous process of self-actualization that few of us will ever even bother with. In the end, this season seemed to suggest that we’re all ultimately alone (check out that last line of dialogue), that we have moments of connection, but they’re few and far between, and ultimately based on things we’ll never understand. You can be married to someone and never know them. Your parents and children will remain mysteries to you. Hell, you can barely know yourself. You’re a lone figure, pitched out over an empty darkness, and you’ll only encounter people in passing. You can cling to those moments, or you can accept the fundamental truth of your existence and get down to maximizing what time and what connections you have. The characters have moments where they almost get this, but those moments eventually wear off. All of human existence is designed to make that the case. I was going to talk a bit here about one of the other major complaints some have had with this season—a complaint I agree with off-and-on—but I think I’ll throw it to you instead. What do you think of the show’s increasing lack of subtlety in dealing with its themes? And what do you think the series’ future holds? Keith: Part of what I admire about the show is the way it thwarts expectations, both in the moment and in the long run. Maybe that’s why you found the Lane story frustrating at times: It went where it looked like it was going to go. (Having said that, I didn’t see his suicide coming, just a downfall of some kind.) As for the show’s central themes, I think you nailed it, though some characters seem to be inching toward a better understanding of themselves. Don, for instance, appears to leave the season a little more aware of who he is, but that person isn’t always loyal, trustworthy, and kind. Roger’s acid trip made him more aware of the swirling, existential void you describe than anyone else. My only solid prediction is that Roger Sterling will have longer hair when the show comes back. As for the lack of subtlety, I’m not entirely sure I agree with your terms, but I know what you’re saying. I think series creator Matt Weiner knows he’s closer to the end of the series than the beginning, and he’s harvesting the seeds the show sowed early in its run. Part of what made the show work so well for me this year—up to and including the final episode, which I liked more than you did—is that it circled back to the show’s beginnings, but by using themes instead of plot. Mad Men began as a show about a man who erased his own past, but it subsequently let that element drift away. Final seasons might find Don under investigation by the FBI, or Peggy confronted with the child she had in secret, or Roger having another heart attack. But to circle back to The Sopranos, those could also all be given the “Pine Barrens” treatment, and the show would still work. We can see the effect of all those stories in the way those characters now live their lives. Don spotted the ghost (phantom?) of Adam this week, but it felt less like the payoff of the first season’s story than like a manifestation of the psychic heaviness he carries with him at all times. All right, let’s hear the complaints, Todd. And let’s talk about “The Other Woman.” And while we’re at it, let me nominate “At The Codfish Ball” as the season’s best episode, a stunning example of the series’ ability to let an episode’s themes play out across every character involved. I also really like your notion of the show reaping the thematic harvest it sowed way back in the first couple of seasons, and it’s an argument I find compelling—even if it won’t entirely make me feel more comfortable with Glen Bishop explaining how everything turns to crap, or with Adam Whitman telling Don it isn’t just his tooth that’s rotten. (Has the show ever had a clumsier line in a pivotal moment like that?) Lack of subtlety is often just another natural outgrowth of a show in its older years. When the thematic buildup is as lengthy as it is here, I’m almost always willing to give a show’s writers latitude in underlining some of their points more forcefully than in the earlier going. Something about bringing things to a climax allows an author to pull back the curtain a bit and say, “This is what it’s been about all along.” I just felt as if there was a touch too much of this in the final two episodes. It isn’t a huge complaint—this is the easy favorite to top my “best of TV” list at the end of the year—but it did give me pause. Another thing that gave me pause: Betty Francis. I realize she missed some of the season due to January Jones’ real-life pregnancy, but she consequently felt even less important to the show and its arc than ever before, something I thought would have been difficult to play after she felt so inconsequential to much of season four. Again, this is something that happens to aging serialized dramas—they accumulate characters that they’re no longer sure what to do with—and I could just as easily see Weiner coming up with a really terrific Betty storyline for season six as I could see him writing her out of the show entirely. I was going to end this paragraph by arguing that I think it’s time for her to go (the show proved it could do good Sally storylines without her this year), but now I’m reluctant to actually advocate it. If nothing else, she needs to be around in the series’ final season. So I guess I’ll punt and ask you what you think. When it comes to “The Other Woman,” I don’t have much to add to my review. I liked it. I think some of the suddenness with which things happened made it feel as if the characters were behaving out of character, though I don’t think they were. But I also think the episode’s last couple of acts worked so very well that they absolved any complaints I would have had about the ending. The contrast between Peggy’s escape from SCDP and Joan’s continued enmeshing within it was fascinating, and that final scene between Hamm and Elisabeth Moss was absolutely terrific. Did you feel differently about the episode? And I do think the future is an interesting topic to tackle. More than any other season finale, “The Phantom” left us with even less of a sense of where season six might pick up, outside of a very basic sense that SCDP’s success has become self-perpetuating. Did you pick up on anything else? Keith: Hmm… I really liked Glen’s line. It’s on the nose, sure, but I felt that putting that disappointed sentiment in the mouth of a kid undercut the obviousness of the moment. But I’ll grant you the rotten-tooth moment, which might as well have flashed the words “Hey! Metaphor!” up on the screen. As for Betty, I didn’t really mind having her sidelined this season. I don’t hate Betty at all, and frankly, I find some of the fervency of others’ hatred—which often feels wrapped up in personal feelings about January Jones—a little creepy. Yes, she’s an often unlikeable, self-centered character. Who on the show isn’t? That said, it made sense for her to be largely offstage this season, even though the real-life circumstances of Jones’ pregnancy were what kept her away. Betty’s story this year was that of a woman getting scared and lost in the midst of domestic comfort. She was another character dealing with the disappointment of success, but hers wasn’t the most dynamic story when compared to those unfolding in the other corners of the Mad Man universe. I was fine just getting telling glimpses of it. I suspect Weiner will find something more interesting for her to do next season. The dynamic between Betty and Sally alone is too priceless to discard. Sally had some great moments this year, only some of them with Betty. But when she got her period and fled into her mother’s arms to find some tenderness served up with a side of self-satisfaction—you don’t get that without Betty. Getting back to “The Other Woman,” I felt like the speed with which it unfolded helped make it work. Everyone felt under pressure to make a decision: The partners needed to act quickly to ask Joan the unaskable. Joan had to make her mind up quickly about whether to… There’s no other way to put it except to say she was deciding whether to whore herself out. The way it played out, with it only becoming apparent later that Don’s pleading with Joan took place after the fact, further emphasized the urgency of the episode, as if the crisis got ahead of everyone’s consciences. Only Peggy, who wasn’t involved in the decision at all, got away clean—and to the accompaniment of The Kinks, no less. The relationship between Peggy and Joan is one of my favorite elements of the show. I’ve been meaning to go back and watch the entire series at some point, and I can only imagine how those early scenes of Joan showing Peggy the ropes, and not very kindly, play in light of what we know is to come. I doubt Weiner knew where those characters were headed—for starters, my understanding is that Joan got a larger role when Weiner realized what Christina Hendricks could do—but I feel like those characters are so well realized, and the way they relate to each other so carefully considered, that it would be fascinating just to watch how their relationship has changed over the years. It isn’t simply that Peggy has come out from under Joan’s shadow, and it’s not like they’re following some schematic feminist/pre-feminist trajectories. They’re both succeeding in a man’s world in very different ways, and that success is exacting different prices from each. For Joan, it was giving up a sizable portion of her dignity. For Peggy, it’s been giving up any kind of life beyond work—apart from the occasional trip to the movies. Both appeared happy at the end of the season, but it’s a qualified sort of happiness. Where will the future take them? Again, I’m hesitant to speculate too much. But as for the future of the series, this season ended in the spring of 1967, ahead of the Summer Of Love. We’re about to enter a period when a lot of the cultural changes and social tensions that have been confined to the background of the action are about to intrude on everyday life in ways that aren’t easy to ignore. I have every hope it will continue to be fascinating to watch. I’m guessing you feel the same way, Todd, but before we wind things up, why don’t we talk about the elements that made this season memorable for you? Todd: For a show that’s often praised for its witty writing and perfect performances, I’m amazed how many of my memories of this season of Mad Men will be purely visual ones. I keep coming back to that empty elevator shaft—both here and in my own reviews—but that’s because it haunted me so, just as I was moved by the image of a desperate Pete listening to his wonderful hi-fi, or Beth sketching that tiny heart in the fog on her window, or Lane’s body hanging behind his office door, or the five partners of SCDP standing and facing a seemingly bright future while swathed in shadow. Mad Men has always had great production values, but it really felt as if the visuals stepped it up another level this season. It was sumptuous, in a way television rarely is. The early seasons of the show were beautiful—and season two is one of my favorite seasons of television ever made—but I’m a bit amazed when going back to them now that they feel just a touch claustrophobic. Matt Weiner took whatever extra money AMC and Lionsgate gave him and shuttled it right back into the show this year. A tight budget can be a virtue on TV—no other show looks like Louie, largely because the show has to come up with creative workarounds for budget problems—but when a show like Mad Men gets a little extra money, it can be a beautiful thing, literally. I’ve seen some commentary around the Internet that this season could have felt like a great ending for the show, and while I can see that point of view, I also can’t wait to see how it deals with the end of the decade, with the events everybody thinks of as “the ’60s.” In an interview with Alan Sepinwall, Weiner talked about how Mad Men is showing the coarsening of American culture—how the world the show started out in slowly turned into a world much more like the one we live in today. I suspect those who’ve complained about the lack of subtlety this season (including myself) will struggle with that for the rest of the series on those terms, but I can’t deny that what Weiner’s doing here is very interesting. He’s trying to encapsulate the changes of a whole nation in a very small group of people without calling attention to it. That’s insanely ambitious, and I’m willing to cut him all the slack in the world if he comes up with moments as good as this season’s best snippets. And even if I had some (very, very small) problems with season five, I’m most impressed by the way it seemed to suggest this show is going to stick the landing. That holy trinity of HBO dramas—The Sopranos, The Wire, and Deadwood—has stood separate for so long for me that I’m almost loath to add another show to that level, yet I have trouble imagining Mad Men doing anything in those final two seasons to outweigh what was great about the first five. Unlike with Breaking Bad—a great show, ready to join that pinnacle, yet one that could conceivably be hurt by a weak ending—this is a series that’s as much about moments, about those tiny bits of life that seem to encapsulate something much larger than they should. 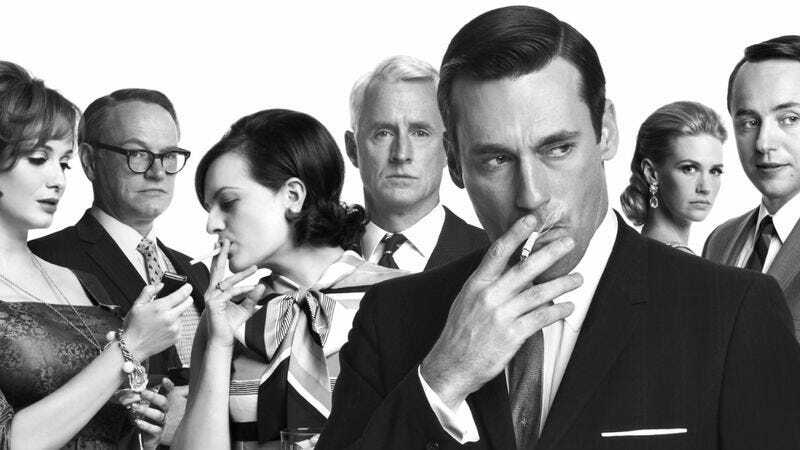 The fifth season of Mad Men wasn’t my favorite of the show’s run, but it was the one that most convinced me this is one of the greatest TV shows ever made. Keith: Seconded, big time. I loathe superlatives, but man, there were times this season when I wondered through the credits whether shows get any better than Mad Men this year. And you’re right: The attention to the visuals had a lot to do with it. I don’t want to touch off a pointless movies-vs.-TV debate again, but I can’t think of a better word than “cinematic” to describe Mad Men’s direction, this season and in others. Weiner has a great feel for dialogue, but he also has the confidence to let the images tell the story. Why use words for what you can express with smoke wafting up through the beam of a film projector? The approach also allows for a lot more mystery and ambiguity, and Mad Men thrives on both. And, sure, it could have easily ended with this season. Looking back, that’s true for most of the season finales. Imagine if the show ended with the midnight-raid founding of Sterling Cooper Draper Price. That would even have been a happy ending, with a bunch of hardworking, morally fallible ad guys escaping the old post-war ways of doing things, and emerging into the brighter possibilities of the mid-’60s. In an interview with The New York Times, Weiner said that this and the end of the third season were the only times he knew for sure he was coming back, but it ends like all those previous seasons ended: Not with a period, but with an ellipsis, trailing off into the unknown. I suspect the last episode of the series, be it after the sixth season or the seventh, will end the same way, and that’s fine. We’re living in the world being formed before our eyes on Mad Men. In many ways, we know now the story ends. We’re watching a story about how we got there in the first place, and the flawed, messy, recognizable lives of those who brought us here.